Carols floating across no-man's-land on Christmas Eve 1914; solemn choruses, marches, and popular songs responding to the call of propaganda ministries and war charities; opera, keyboard suites, ragtime, and concertos for the left hand—all provided testimony to the unique power of music to chronicle the Great War and to memorialize its battles and fallen heroes in the first post-Armistice decade. In this striking book, Glenn Watkins investigates these variable roles of music primarily from the angle of the Entente nations' perceived threat of German hegemony in matters of intellectual and artistic accomplishment—a principal concern not only for Europe but also for the United States, whose late entrance into the fray prompted a renewed interest in defining America as an emergent world power as well as a fledgling musical culture. He shows that each nation gave "proof through the night"—ringing evidence during the dark hours of the war—not only of its nationalist resolve in the singing of national airs but also of its power to recall home and hearth on distant battlefields and to reflect upon loss long after the guns had been silenced. Watkins's eloquent narrative argues that twentieth-century Modernism was not launched full force with the advent of the Great War but rather was challenged by a new set of alternatives to the prewar avant-garde. His central focus on music as a cultural marker during the First World War of necessity exposes its relationship to the other arts, national institutions, and international politics. From wartime scores by Debussy and Stravinsky to telling retrospective works by Berg, Ravel, and Britten; from "La Marseillaise" to "The Star-Spangled Banner," from "It's a Long Way to Tipperary" to "Over There," music reflected society's profoundest doubts and aspirations. By turns it challenged or supported the legitimacy of war, chronicled misgivings in miniature and grandiose formats alike, and inevitably expressed its sorrow at the final price exacted by the Great War. 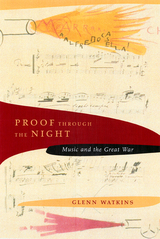 Proof through the Night concludes with a consideration of the post-Armistice period when, on the classical music front, memory and distance forged a musical response that was frequently more powerful than in wartime. Glenn Watkins is Earl V. Moore Professor Emeritus at the University of Michigan, Ann Arbor, and author of Pyramids at the Louvre: Music, Culture, and Collage from Stravinsky to the Postmodernists (1994), Soundings: Music in the Twentieth Century (1988), and Gesualdo: The Man and His Music (1991). The Strasbourg Olympic Games in Music—Beethoven and Jean-Christophe—Romain Rolland and Richard Strauss—Above the Battle? Chapter 12. "Dance of Death"
Chapter 13. "The Last Days of Mankind"
Chapter 14. "The Yanks Are Coming"
Chapter 15. "Onward Christian Soldiers"
Chapter 17. "Proof Through the Night"
Chapter 18. "On Patrol in No Man’s Land"
Armistice and Celebration—"Goin’ Home"—"My Buddy"
Triptychs: Grünewald, Dix, and Hindemith—Gershwin’s Strike Up the Band!